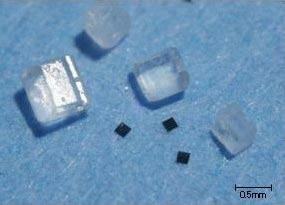 The Japanese giant Hitachi has developed the world’s smallest and thinnest Radio Frequency Identification (RFID) chip. Measuring only 0.15 x 0.15 millimeters in size and 7.5 micrometers thick, the wireless chip is a smaller version of the previous record holder – Hitachi’s 0.4 x 0.4 mm “Micro-Chip”. The company used semiconductor miniaturization and electron beam technology to write data on the chip substrates to achieve this decrease in size. The new chips have a wide range of potential applications from military to transportation, logistics and even consumer electronics. Hitachi’s new line of rfid chips are also built with VPN enabled technology. Nicknamed “Powder” or “Dust”, these chips consist of 128-bit ROM (Read Only Memory) that can store a 38-digit number. Hitachi says the distance between each circuit element was reduced using the Silicon-on-Insulator (SOI) process, where an insulation layer and a monocrystalline silicon layer are formed upon the silicon base substrate, and the transistor is then formed on this SOI substrate. When compared to the conventional process where a transistor is formed directly upon the silicon substrate, this technology significantly reduces parasitic capacitance and current leakage, improving the transistor’s performance. The SOI process also prevents the interference between neighboring devices, which often causes product malfunctions. Thanks to an insulator surrounding each device, Hitachi experts say that even when the devices are in close proximity, higher integration is achieved on an even smaller area. The surface area of the new chips was reduced to a quarter of the original 0.3 x 0.3 mm, 60µm-thick chip developed by Hitachi in 2003. The company says that developments in thin chip fabrication technology enabled the significant decrease in width – to one-eighth of that of the previous model. With more chips that can be fabricated on a single wafer, productivity was increased by over four times, and Hitachi expects this will open the way to new applications for wireless RFID chips. The µ-Chip uses an external antenna to receive radio waves, which can be transformed and wirelessly transmitted as a unique ID number. The data is written during the fabrication process, using ROM, and is therefore non-rewritable, providing a high level of authenticity. “By taking advantage of the merits of compactness, high authenticity and wireless communication, and combining it with Internet technology, the µ-Chip may be utilized in a broad range of applications such as security, transportation, amusement, traceability and logistics” – said Hitachi engineers who worked on the project. Hitachi is continuing to develop technologies that increase communication’s distance range and decrease antenna size, whilst preserving high reliability and aiming for improved productivity. The company said that the enhanced compactness and thinness of the new chip has further broadened the range of possible applications, including gift certificates that can be authenticated. The new RFID “powder” can also be incorporated into thin paper, such as currency, creating so-called “bugged” money. Miniature RFID chips may also have advanced military applications such as smartdust. Smartdust is the concept of wireless MEMS (Micro-Electro-Mechanical Systems) sensors that can detect anything from light and temperature to vibrations. Using a large amount of sensors is not a new concept – the U.S. military experimented with this idea already during the Vietnam War (Operation Igloo White). While the older sensors were relatively large and only somewhat effective, Professor Christopher Pister from UC Berkeley suggested in 2001 to create a new type of micro sensor that could theoretically be as small as a grain of sand. Research into this idea is ongoing and is being funded by DARPA (the Defense Advanced Research Projects Agency). What was only a theoretical concept in 2001 has now become a reality with the latest development by Hitachi, and could find its way to intelligence agencies across the world. RFID chips are also a source for increasing controversy surrounding issues of privacy. An RFID chip can be used to track the location of unsuspecting individuals who have bought products that include RFID tags in their package. Having miniature cheap RFID chips, such as those developed by Hitachi, implanted inside anything we buy might make many people feel very uncomfortable. However, big businesses believe that consumers’ fears are dwarfed by the benefits of RFID chips, which include reduced theft, digital real time inventory, and better information on consumer shopping habits. TFOT looked at several RFID related technologies including HP’s Memory Spot Chip, which is some what similar to RFID technology (although there are also some important differences), The RFID Loc8tor that can identify special RFID tags from a distance of up to 183 meters (600 feet), and a new Nanobattery technology developed at the Tel Aviv University, which could power semi-active RFID chips in the future. Hitachi is constantly developing new and advanced chips. After publishing the information regarding the 0.15 x 0.15 millimeter RFID chip back in 2006, the company apparently completed working on the improved RFID chip in early 2007. According to the Nikkei website, Hitachi is now planning on developing an even smaller RFID chip using 65-nanometer lithographic technology.